Today many of us are waking up to learn about the tragic events in Las Vegas, NV that took place yesterday, October 1. At least 50 individuals have died as a result of the shooting of one lone individual. Some 200 others are injured, some serious, which will likely raise the death tool. Immediately, our efforts need to be in comforting those who have lost love ones due to violence. The event might re-traumatize those who have lost friends and family as a result of gun violence. We should comfort and reassure each other, and check in with those who might be vulnerable. Children in particular need our attention right now. As we continue to learn about the perpetrator and the victims, we can’t escape the fact that this is an act of violence committed with a gun. For a society that has been lauded for its creativity and ingenuity in medicine, technology, media, business, education, and so many other fields why have we failed to come up with a strategy to ending these events? We will soon enough be wringing our hands and pointing fingers. And our political leaders will likely fail us again in coming up with answers. 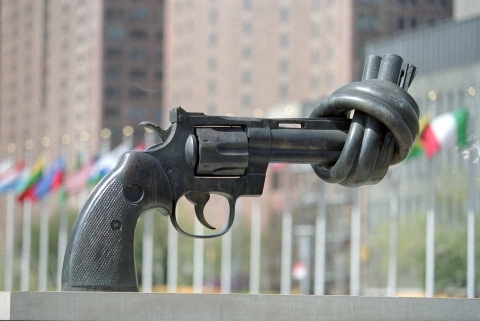 I’ve posted a photo of Swedish artist Carl Reuterward’s sculpture known as the “knotted gun.” It is located in the outdoor plaza at the UN visitors entrance in New York. You can read about it here. With sad irony, today is Mahatma Gandhi’s birthday (October 2) and the International Day of Nonviolence. How do we become a world where this is not an aspiration, but a reality?